Congratulations to Peter Schumann of St. Paul who passed his Flight Test with the FAA on Saturday August 5th at Stanton Airfield. 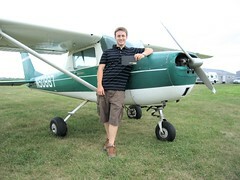 Peter turned 17 in April and began taking flight lessons in December 2005 in Stanton's Cessna 150 aircraft. Peter flew roughly 8 hours with an instructor prior to being granted his solo pilot certificate in April while still 16 years old. He then flew another 32 hours practicing to pass the test with an FAA examiner. The test involved several hours of oral questions by the examiner in areas of aircraft systems, airspace, navigation, weather, and aerodynamics. Following this Peter took the examiner up for several flights to demonstrate his skills in the aircraft, with particular emphasis on safety awareness and emergency procedures. With his new license Peter can now take passengers up flying, and he already has several fly-in destinations in the area he intends to visit. Peter attends Central High School in St. Paul. We are proud to announce that our sixth "Dinner On Us" gift certificate is for $50 to the Tavern of Northfield. By becoming a member of Northfield.org you will be entered into the Dinner On Us membership drawing. The deadline for this week is midnight on August 13, with the winner being announced on Monday, August 14. WCCO News in the Twin Cities is reporting that 18-year-old Natalie Smead of Northfield died three hours after she was struck by a train in a tragic accident Saturday afternoon about 4 p.m.in New York City. The television news report indicated she was in New York visiting family and that it was unclear if she was pushed or fell onto the tracks. When she tried to crawl from under the train, she was hit by another train on the adjacent tracks. There aren't a lot more details, but you can get the entire story at WCCO News or on its news broadcasts on Channel 4. You can sign up today for the Minnesota Firearms Safety Training Course, offered by the Northfield Public Schools Community Services Division and the Cannon River Sportsmen’s Club. This class and field trip will cover safe gun handling, gun safety in the home, care and storage of firearms, marksmanship and hunter responsibility. Students who enroll must be 12 years old by Dec. 31, 2006, and there is no maximum age Class dates are Aug. 21-24, 28-30, with the field trip on Aug. 26. For more information or to register for this class, stop at the Northfield Community Services Office, located on the first floor of the Northfield Community Resource Center (NCRC), at 1651 Jefferson Parkway in Northfield. For more information, call Erin at 664-3649, or go online to www.nfld.k12.mn.us. Mark Etzell is the Adult Enrichement Coordinator for the Northfield Public Schools Community Service Division. Mitch Patrikus sent us this cute picture of his little sister to enter our "Beat the Heat Photo Contest." Sure, it's cooled off a little, but it's still August, the sun is shining and we can finally head out and enjoy it. When you head out, take your camera and capture the fun. Then send the photos to us. The grand prize will be $25 worth of ice cream and lemonade for you and your friends—as long as you agree to send photos of the party. 2. Create an e-mail, attach photo. 3. Describe the photo, add your name. Deadline is August 15. You can see all the entries by clicking on the photo above. Want a ticket to see this hot car in action? A free ticket? How about two free tickets? The Girl Scout Council of Cannon Valley is holding its first Girl Scout Day at the Races on Saturday, Aug. 12. The event begins at 2:30 p.m. at Country Joe Racing in Lakeville, with lots of fun activities for the whole family. Registration for this event has been overwhelming, with more than 500 kids coming -- and 57 of them from Northfield. There are so many scouts, we are looking for more volunteers to help supervise some of the day's activities. Each volunteer will receive two passes to attend the races that evening at Elko Speedway at 6:30 p.m., where you can cheer on the Girl Scout car. Volunteers need to arrive at Country Joe Racing, 22222 Dodd Road in Lakeville, at 1 p.m. on August 12 for orientation and a tour of the facility. Here are some of the activities where we need volunteer help: field games like kickball, tug of war, obstacle course, croquet, archery. We also need assistance with arts and crafts, karaoke, orienteering, and at the petting zoo, inflatables, and registration. The Dundas Dukes finished their regular season on Sunday with a 3-2 loss to the Cold Spring Springers. Mitch Patrikus was there and submitted a handful of pictures from the game, which are collected in this photo gallery. The Dukes play the Hastings Hawks on Sunday, Aug. 6, at 2 p.m. in Miesville. This is the first round of the CCVL tournament. The Northfield Knights were slated to pay Tuesday night in a best-of-three play-in against the Red Wing Aces, but the was cancelled due to rain. The Knights were down 0-1 in the series and needed to break a long losing streak to stay alive. They get another chance at 8 p.m. Wednesday, that's tonight, at Sechler Field, as the teams make up last night's game. Even if the Knights win, they'll need one more win to make it to Miesville this weekend. New designs for Way Park, incorporating the current park and the recently reclaimed land from the former Northfield Hospital site, will be presented to the public at 7 p.m. on Wednesday, August 2, at the NCRC Dining Hall, 1651 Jefferson Parkway. Spencer Jones, a landscape architect and member of the Northfield Park Board, was commissioned by the Park Board to create the designs and present them to the public for comment. All are welcome to attend the presentation and share their feedback. For more information, contact Judy Swanson of the Friends of Way Park at 645-6017. If you're not sick of talking about weather yet, we've got one last little tidbit before this hot spell (hopefully) breaks. The heat index today topped out at 116F. That's right, one hundred and sixteen degrees. Fortunately, the five day forecast for Northfield shows highs in the 80s and some precipitation for the rest of the week. WCCO.com has lots more information regarding the weather today and the smoking-hot July. We here at Northfield.org hope everyone came through the heat wave with as good of spirits as possible and look forward to complaining about the week we'll spend in January where the highs are all below zero. We are proud to announce that our fourth "Dinner On Us" gift certificate is for $50 to the Contented Cow. By becoming a member of Northfield.org you will be entered into the Dinner On Us membership drawing. The deadline for this week is midnight on August 6, with the winner being announced on Monday, August 7. We are happy to report that Kevin and Peggy Fink are the winners of this week "Dinner on Us" drawing, which means they recrive a $50 gift certificate for Froggy Bottoms, just for joining Northfield Citizens Online, the group that brings you Northfield.org. We will bring you a photo and some comments from our winners as soon as we reach them with the good news. Enter our Beat the Heat photo contest! Sure, it's going to be hotter than Hades this weekend. And you can hide in the air conditioning if you must. But, as a weatherman said last night—in about 90 days it could be snowing. So we have decided to challenge you to wipe the sweat from your brow, seize the moment and take some photos to record this amazing weekend. We are calling it the "Beat the Heat" photo contest. The grand prize will be $25 worth of ice cream and lemonade for you and your friends—as long as you agree to send photos of the party. We were inspired by a couple of photos we received Thursday night. Carl and Joan Behr have been doing a spectacular job of chronicling all the events of the Vintage Band Festival. Amid all the tubas and crazy Alpine horns, they sent a gorgeous photo of one of the hot air balloons that drifted over the city as part of the opening celebration. Then Kelly Irvine sent the charming photo above in which her dad, Scott Anfinson, captured her 5-year-old son as he watched the balloons drift through the evening sky. Sure, it's hot...but let's make the most of it. And the contest is easy. Oh, yeah, a deadline...Aug. 15. After all, it's too hot to rush around. The unveiling of the Faribault Trail head for the Sakatah/Singing Hills Trail and the Mill Towns Trail took place this morning at the former White Sands Park next to highway 21. You can click on the photo to see a larger version of it and the rest of the gallery of photos from the event. A serviceable building with covered picnic spaces and indoor toilet facilities has been built with funding from Faribault Parks, the Department of Natural Resources, a grant from the Multiuse Fund (snowmobile/bicycle), and bonding money from the Minnesota Legislature. Yay! More Northfield.org statistics! Here we are, again, providing readers with more interesting Northfield.org statistics and analytics, based on data collected from June 25, to July 27. We are proud to announce that our fourth "Dinner On Us" gift certificate is for $50 to Froggy Bottoms. By becoming a member of Northfield.org you will be entered into the Dinner On Us membership drawing. The deadline for this week is midnight on July 30th with the winner being announced on Monday, July 31th.